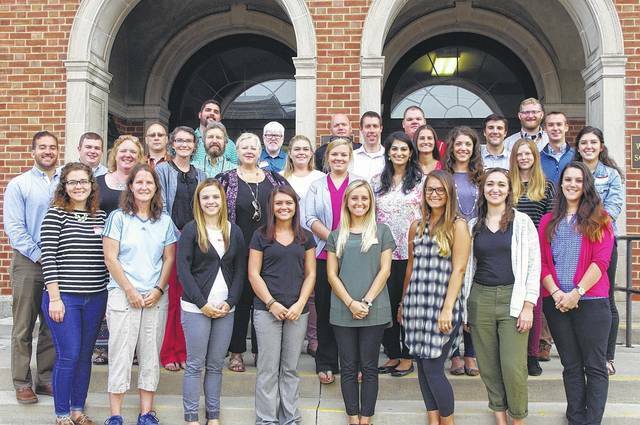 New hires at Delaware City Schools pose for a photo outside Willis Education Center. The teachers were at Willis Thursday and Friday for new teacher orientations. The first day of school is Aug. 16. From left to right, front to back: Meredith Heber, Angela Thompson, Staci Brocious, Sarah Stine, Jenna Onderko, Dianna Wise, Natalie Geer, Laura Lesueur, George Brown, Jordan Nicol, Micki Cotterman, Don Burroughs, Jessica Brechbuhler, Paul Olen, Melissa Kaasa, Megan Norem, Chelsea Lucas, Doreen VanHoose, Lyda Schilling, Laura Langenberg, Julie Magnuson, Joshua Bracken, Nicholas Smith, Andrew Bricker, Chris Downey, Michael Troutman, Cassie Bricker, Clay Thomson, Aaron Cable, Mark Tegtmeier.